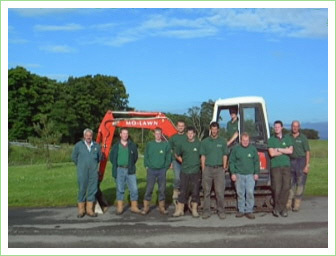 Established in 1991 with initial assistance from the Scottish Princes Youth Business Trust and Forth Valley Enterprise, Mo-Lawn Landscape Supplies and Services now operate throughout Scotland. We moved to Stockbridge - Dunblane in 1998, then with one tunnel and an office and in 2004 having built a new office and with five tunnels, large glasshouse and a large storage shed on site. Operating from our offices at Stockbridge Nursery, Dunblane we employ a skilled, highly motivated and conscientious workforce. We are able to handle any enquiry from implementation through to completion of the project. With regional contacts in Aberdeen and Oban, we welcome enquiries from throughout Scotland. George Morrison - Managing Director. Michael Warnock - Foreman Landscaper. Michael is a bricklayer to trade, and has joined the Mo-Lawn team with a wealth of timber construction skills, as well a good knowledge of monoblock paving and slabbing, he is joined on the team by Hamish Malcolm (Big H) whom is carrying out a Landscaping Apprenticeship at college and on site. Davey MacFarlane whom carries out the deliveries for all the landscaping materials has a wealth of greenkeeping skills and often brings this forward in the lawn projects, we have seasonal team help at times as well. Drew Burns - Grounds Maintenance Supervisor. Drew heads up the grounds maintenance works, Drew (left) is partnered with David Smith (right) and together they have a wealth of grounds maintenance experience, they have seasonal assistance on projects if required, as well as sometimes helping Michael and the other team. Karen Swan - Nursery Supervisor. Karen Swan looks after the Nursery and all aspects of the bedding and shrub propagation and growing, with Hannah, George & Lynn's other daughter looking on and assisting, Karen works tirelessly to ensure the eighteen thousand bedding plants and over two hundred hanging baskets that we grow are the best quality. If you visit the Nursery Tony Ball Karen`s fiancée will load you all the materials you need he is in charge of all the Yard side as well as "the jack of all trades" for sorting the teams machinery, and customers machinery when booked in for repair or service. Works along with Karen specifically looking after the trees and shrub stock in the Nursery, assisting with the watering and feeding of the bedding plants, Natalia is currently studying garden design at college and assists in creating designs for Mo-lawn customers gardens.